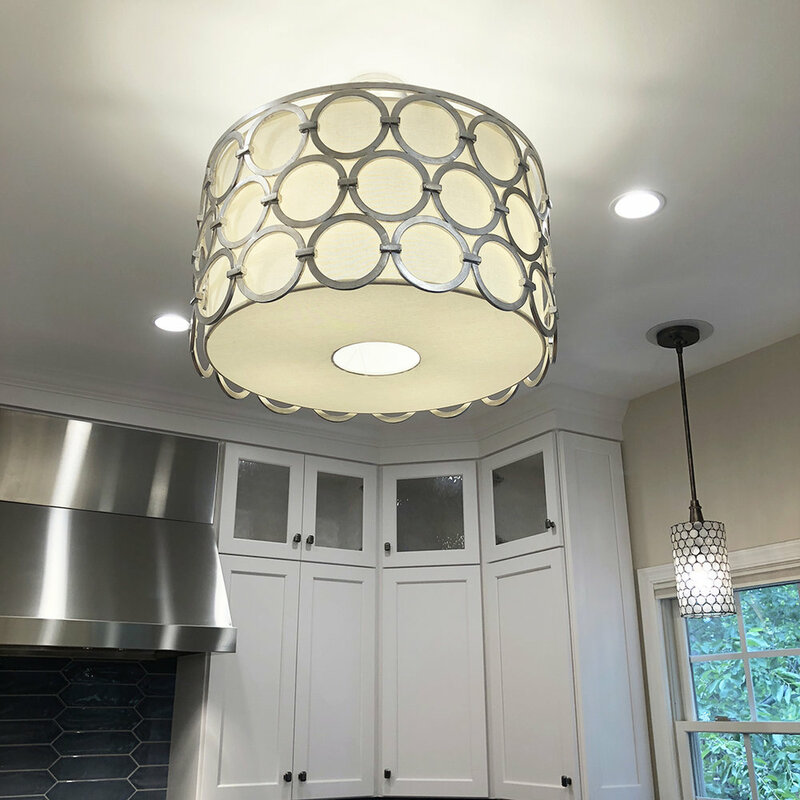 The Mathe Design team got a call for a kitchen renovation and we were pleased to find a nice space that needed some life brought back into it. 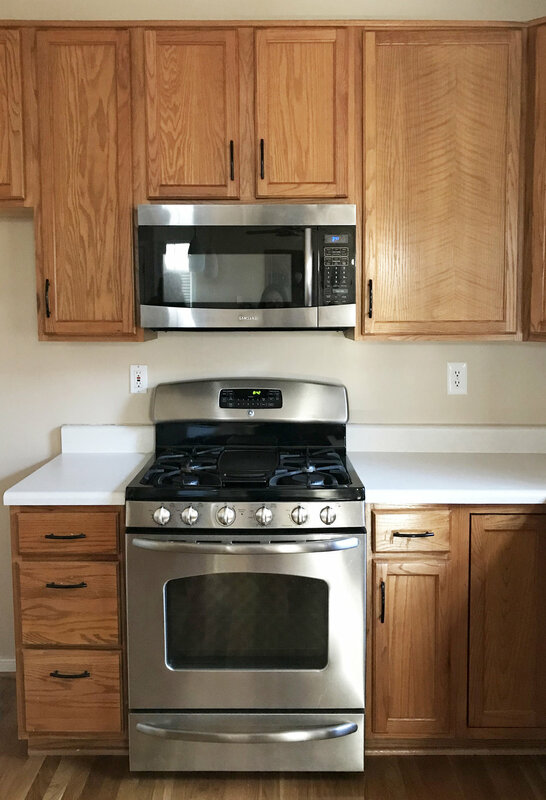 This previously 90's style kitchen had natural wood stained cabinets which were beginning to fade and sag. Functionally it worked, but yet not as well as it could. So we grabbed our aprons and got to planning. 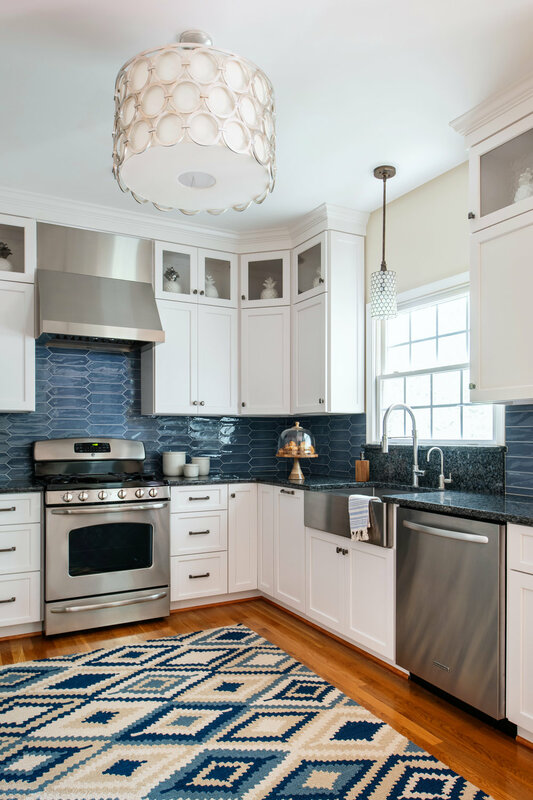 The homeowner was interested in a kitchen that is fresh and clean, but also warm. We settled on a clean white cabinets and warmed them up with matte black jewelry - I mean hardware. We closed in the doorway that led from the kitchen to the dining room. The dining room had another adjacent entry, so by losing this door we were able to grab more lineal square footage for the kitchen while maintaining access to the adjoining dining room. We settled on a U-shape design that increased their counter and cabinet space. It was a little adjustment getting used to the idea of no island - and so far nothing has been placed/dropped on the once-upon-an-island space where a rug adds warmth to the room. 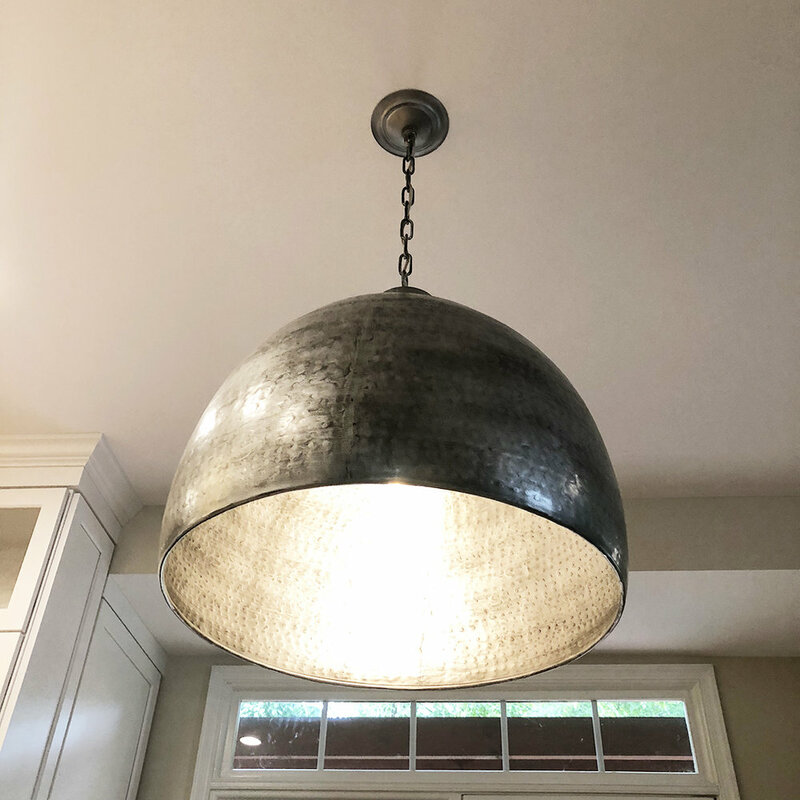 With our clients desiring an updated transitional style we sourced lighting from Currey & Company, Visual Comfort and Arteriors Home in a beautiful silver toned finish. Keeping the themes of fresh and warm in mind, we used large lighting to create a sense of space within a space and intimacy. The large pendant over the table gives definition to the eating zone, while the large semi-flush defines the prep/work space. Additional recessed can lighting properly lights the space for prepping without taking away from the focus on the main decorative fixtures. All the lighting is dimmable for flexibility in light levels depending on how the space is being used. We finished out the kitchen adding a fresh and warm tile backsplash that adds texture but is easy to wipe clean from Ceramic Technics. And grounded this delightful space with an exciting blue pearl royal granite. That creates contrast against the clean white cabinetry as well as adding warmth.